Oh how I love new drugstore beauty products! 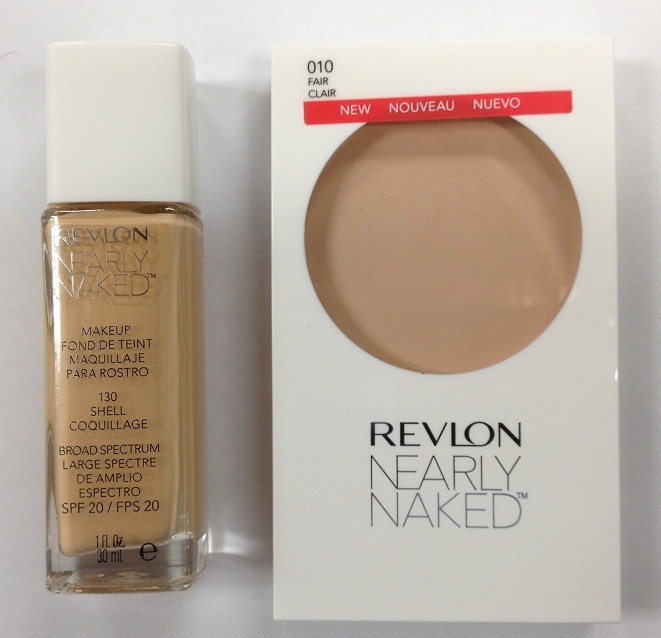 I recently saw an advertisement for Revlon's new Nearly Naked line and was very interested in trying it. Makeup so refreshingly light it melts right in, creating a fresh, even look.Pressed powder blends seamlessly with a lightweight feel. So last week I purchased both the powder and the foundation to try. I decided on Shell for the foundation since that's what shade I wear in Revlon's PhotoReady line, and I chose Fair for the powder. And I really like it! The foundation is very thin and blends in so well. It's more coverage than you get from a tinted moisturizer, but it's definitely not a full-coverage foundation. I have tried both a damp foundation brush and a damp beauty blender, and with both I get nice sheer coverage that evens out my complexion wonderfully. Topped with the pressed powder, I found that I did not need to touch up at all during the day. The powder comes with a very small spongy applicator, but I used a powder brush with it to set my foundation. The Nearly Naked products are on sale for $6.99 this week, and you'll get $2 back in ExtraCare Bucks for each product you purchase (up to 6 items). That brings the net price to $5 which is a bargain for such good products. So if you happen to be looking for new face products to try, I'd definitely recommend giving these a try if you like a lighter-coverage product. Happy Belated Birthday to WC! Fun Giveaway at Manicure Mommas!